The Sweet Fantasy Club’s # 5 challenge (started by Preeti of simply tadka) was chocolate barfi and eggless chocolate crepe with strawberries.The word barfi reminds me of Ranbir Kapoor and Priyanka Chopra. Just can’t help it… loved the movie. Barfi (Murphy) and Jhilmil were just fantastic, innocent and reminded us that basic happiness and laughter in our lives is very important. For eons the recipe for barfi has been gathering dust or rather the page has turned yellow. Its my phobia of making indian sweets. 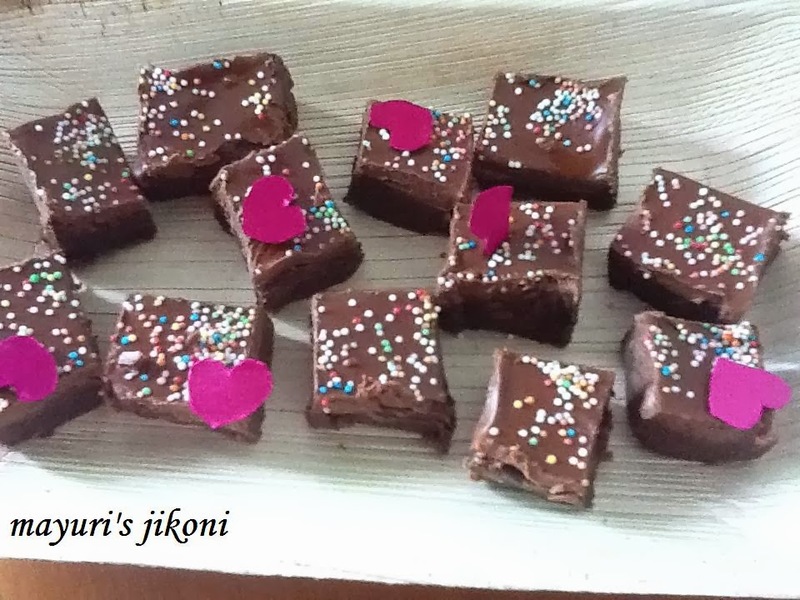 So when the challenge came up, dug out the recipe and made the chocolate barfi. My hubby and I both love chocolate so I made a double chocolate barfi (notice the thick layer of chocolate on top :). Making barfi is no big deal, wonder why I bought ready made ones when in a jiffy yummy home made ones are more delicious. I made the barfi using ready made mawa (khoya). I made them as a treat for Valentine’s day and have to make another batch soon. The milk chocolate topping made up for the reduced amount of sugar I used. You can increase the amount if you like. Grease a tray 6″ X 6″. If you don’t have that size tray, use a bigger one but layer the barfi on one side of it. Can use a round plate with high rim too. Put the grated mawa in a pan over medium heat. Stir it till it melts. Don’t let it burn or cook too much. Add sugar and milk. Mix and stirring frequently, cook till the mixture thickens. This will take about 4 to 5 minutes. Add cocoa and cardamom powder. Mix well. Spread the mixture into the prepared tin or tray. I used the back of a greased spoon to spread the mixture into an even layer. Put the chocolate into a small heatproof bowl. Heat some water (1-2 inch deep) in a pan. Place the bowl into the water. Stir the chocolate till it melts. Pour the melted chocolate over the barfi. Spread it out evenly with a spatula or spoon. Bang the tray gently on your worktop to even out the layer of chocolate. Let the barfi set. Cut into pieces and serve. To make a half white and half chocolate layered barfi, divide the mixture into 2 before adding the cocoa. To one part add 2 tbsp of cocoa and mix. Layer the white part and then layer the chocolate part on top. While spreading the barfi, press it down gently as you don’t want a compact layer. Mawa barfi stays well at room temperature for 4 to 5 days depending on the weather. Store the remaining barfi in the fridge. Barfi looks really lovely and tasty. wow fantastic chocolate burfi dear 🙂 looks yumm !! Very delicious chocolate burrito dear! !